Edit (7/31) to add: this is a revised new and improved version from the one I posted yesterday (7/30). Since I uploaded the photos to a new hoster, I have added photos insted of making links to them. I wasn't able to post this in the "How To"section, since I'm not a Mod, so it's here. I first got the idea of installing an oil cooler fan last summer when, on Cyber's oil temp gage, I saw a reading of 350F (177C). It wasn't a particularly hot day but I was going from stop light to stop light without any significant constant speed. Therfore the oil never had a chance to cool down. 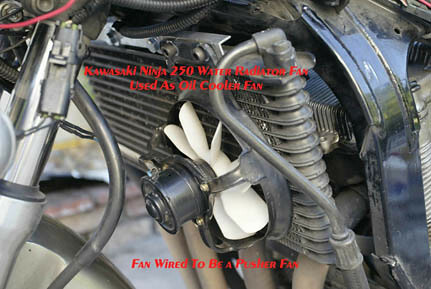 I did some R&D work with a Kawasaki Ninja 250 water radiator fan wired backwards so it would blow. Normally it sits behind the radiator and pulls the air through it. 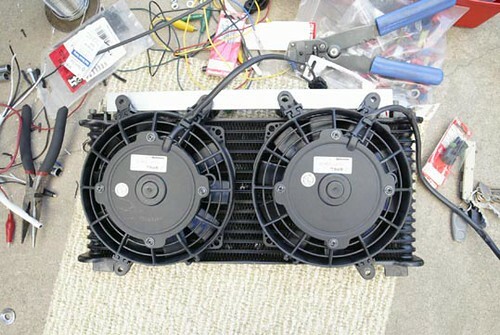 There is also an exsisting thread on the subject of Oil Cooler Fan(s) that I did some posting. But now on with the show. 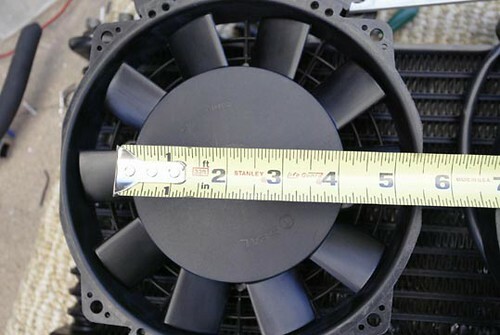 I came to the conclusion of using 2 SPAL 6-1/2" fans which are designed for motorcycles & ATV's for the reason that they are very thin. You can see the spec sheet here. I bought the fans from A1 Electric Automotive Accessories. Edit to add: I used the raised 3/4" (0.75) mounting tabs. Part #30130017. They are sold in a set of four. Now these size fans fit the cooler just about perfect. However, the intake side, which will face the cooler has about 4 inches of dead space. Yet even so the actual installation of the fan shows that the fans do not completely block the air from entering. Time will tell if this fan works or not. After choosing the fan the next step is fabricating a mounting system for the two fans. One thing I found out is that the cooler needs to be positioned forward from the stock location. 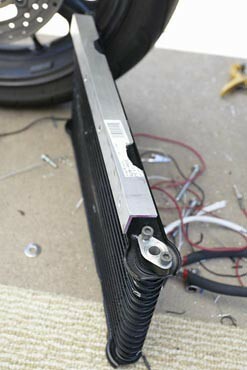 Even though the fans are thin, the oil cooler still needed to be relocated. I originaly was going to cut the lower OEM brackets off with my Dremel tool and weld them back on. However, there was no way I was going to be able to maneuver the cut off wheel in such a tight place. So plan B. Using some scrap aluminium I already had, I fabed up 2 C shaped brackets along with a length of 1/8" thick aluminum cut to the length of the OEM tabs to mount the lower fans to. I used JB Weld & pop rivets to attach everything together, then I let it set overnight. Now to tackle the top bracket. Again I used what I already had, so I cut a length of L-shape aluminum to mount the fan to. The cutouts in the L-bracket are for clearence. 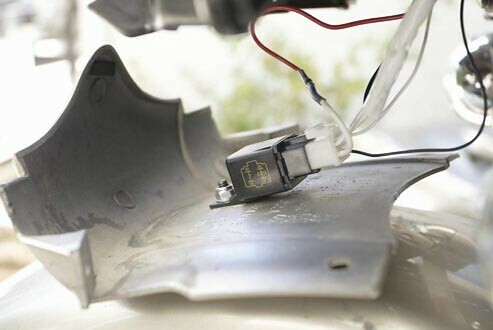 The lower triple tree contacts the aluminum bracket. If I had used just plain 1/8" bar like the bottom, cutouts would not be necessary. But I figured using the L-bracket for more rigidity, since the top bracket is carring the load of the two fans. Now I just realised I did not take a picture of how the fans are bolted to the top bracket. But I do have one pic that shows the outside mounting tab bolted to the bracket. 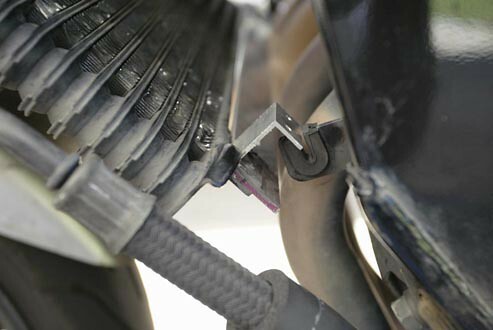 The top inside plastic fan mounting tab was enlarged with a drill bit to allow the bolt that attaches the oil cooler to the frame to also fasten the inside mounting tabs on both fans. I did not drill holes for the lower center brackets because the dificulty in getting an accurate measurement. So the fans are mounted at 3 points. 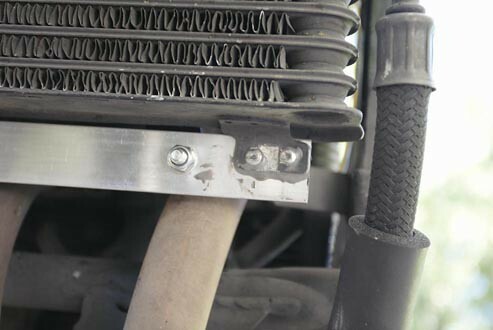 The hardware needed was two 8mm x 60mm bolts to replace the oil cooler's OEM mounting bolts. Two spacers: 1/2" inside diameter x 3/4" in length for the top spacer mounts in between the L-bracket and the frame. And four nuts & bolts: 6mm x 25mm (I think, or 20mm), with washers to mount the fans to the brackets. These materials I bought at Ace Hardware since they have a greater collection of metric stuff than what Orchard Super Harware does. Now that the mounting brackets are done, next is the electrical. 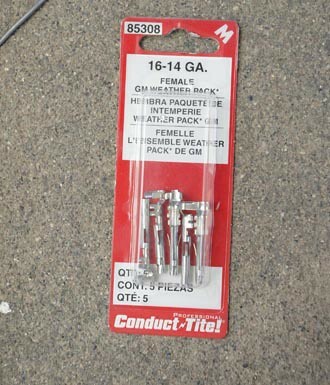 I went to Pep Boys to buy Pilot Automotive's pre-wired harness with relay and switch. It's designed for driving lights etc. I mounted the relay on the lower nose cowling. 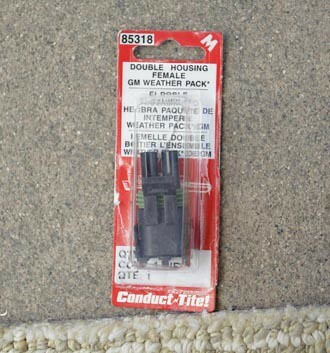 Then I used a DIY GM electrical connectors, that I bought at Pep Boys, to make two male/female plugs to power the fans via the relay. The main power for the the fans came from my Blue Sea fuse box. The power for the relay switch came from taping into the the parking/third eye light. 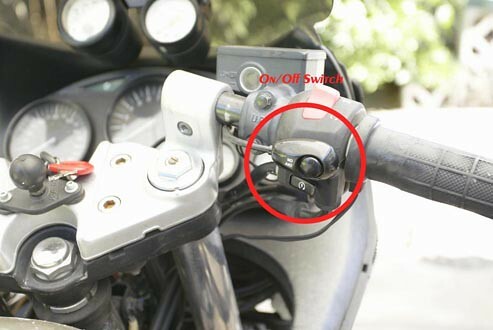 And the switch was installed at the handlebars to manually turn on and off the fans. I also wired in a LED so I can tell when the fans are on. With that Kawasaki fan I could not hear if the fan was on or not. 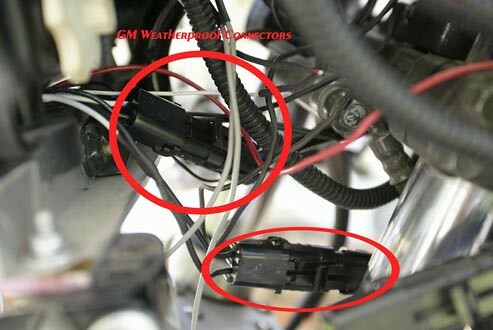 All electrical connections were spliced, soldered then protected with heat shrink tubing. I connected my multimeter to determine what the amps it was drawing so I could use the correct fuse. It spiked at 20-21 amps then settled down to around 8 +- amps. I put in a 20 amp fuse and cycled the fans a couple times to see if it would blow. Nothing so far. Mind you, this was with the engine off. If someone has a way off improving the spiking, post it. I finished everything this evening so I have not been able to test the cooling effect. This week it's supposed to be just under 100F (38C) so I should be able to post the actual results at the end of the week. If you have any questions post them and I'll try to answer them in a timely fashion. 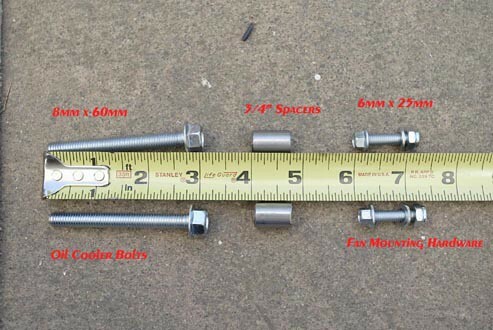 All of nuts/bolts/washers & spacers below cost no more than $20.00. I ended up buying more than what I needed. I believe that's everything. If I miss something I'll add it later. Sorry man, none of your pics that link to Yahoo Pictures work. (Yahoo pictures is closing on sept 20). May want to host them elsewhere. All of the pics worked for me. I'm interested to see your results. After reading BP's comments in the other thread, I'm wondering how much of an effect the fans will have when they're off. You almost need a isolated area with constant temps to test without the fans, with fans off, and with fans on. Anyway, let us know how the cooling seems to work. We're sorry. Yahoo! Photos is closing on September 20, 2007 so we are no longer accepting new accounts or allowing users to upload photos if you don't already have photos in your account. We've decided to focus all our efforts on Flickr - the award winning photo sharing community that Time Magazine has even called "completely addictive". Why not head over to Flickr for a look? Good write up, the materials list and sources are great. Pics would make it world-class and Sticky-worthy. I still say re-claimed computer fans- thin, 12-volt (more or less) and better than cheap- FREE- would be the bee's knees. I'd bet with a tube of RTV and a can of silicon spray, you could waterproof them, too. 'Course, then they wouldn't be free, technically. I checked the settings for the album and the pics. They are all set for public use so I don't know why some of you can't view them. I'll look into another place to host the pics, this way instead of linking them I can just post them. I think the problem with that is computer fans don't pull as much air as the types of fans that he used on his project, the high end computer case fans are only rated at 120 CFM (120mm size), while the fans used in the project are rated at 330. I don't think case fans pull enough air to be effective. 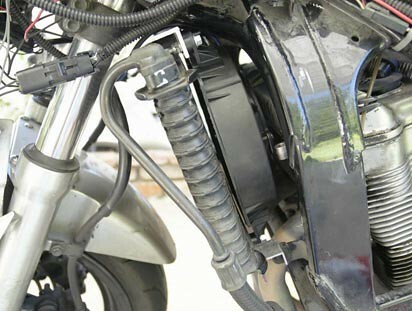 Squiggy - Where did the top stock mounts for the oil cooler go? 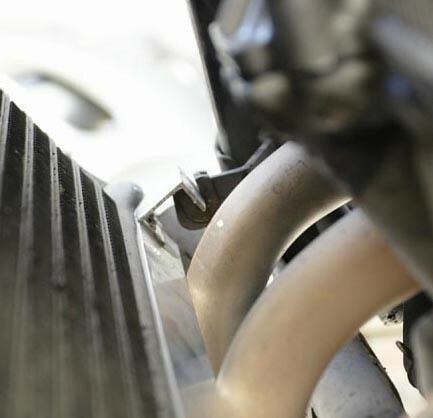 In the pic you have showing the top bracket on the oil cooler they aren't there? Let us know if you see any difference in the oil temps. The stock oil cooler mount is still there, it's just hidden behind the L-bracket. I'll try to take a picture of that in the future. It's just that I would have to strip the bike down again to get that shot. I'm going to upload my photos to a different picture host for this install and redo the write-up so I can add the photos along with the wording. I may mess up a little but I should be able to get everything squared away. Ok, I've just done a new & improved version and it's works fine. Now with pictures. squiggy, please keep me (us) posted on the temp differencial with the fans (i.e. 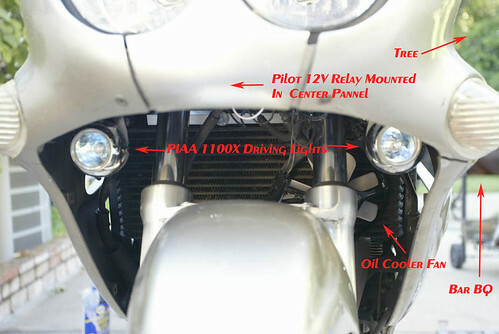 - static field testing, parked on the centerstand) -- I want to know if you get the bike up to 250+ F and switch on the fans at a stand-still, will it knock the oil temp at the pan back down to 210 or lower? I'm really curious about this, and if so, may look into doing the same upgrade in the near future (I still need to fab up the brackets to mount that 750 cooler into my 600 anyway -- just the excuse I could use). Meanwhile, unlike last year, this year I have yet to see temps in excess of 275 F or so... thank my lucky stars. squiggy, please keep me (us) posted on the temp differencial with the fans (i.e. - static field testing, parked on the centerstand) -- I want to know if you get the bike up to 250+ F and switch on the fans at a stand-still, will it knock the oil temp at the pan back down to 210 or lower? I'll know more at the end of this week. So why mount the fans to pull instead of push the air ? I'm betting so that the fans aren't blocking air flow when they're not on. I was thinking the same thing until I finally got a look at the pics. The fans I used do pull air through the cooler by mounting them from behind. Correct. If I mounted them in front of the cooler they would cause an obstruction to the air at speed. We discused this subject a little at the other oil cooler fan thread that I linked above.